Platinum Horoscope Platinum Horoscope will include folllowing features Convention ..
Kundli is graphical representation of 9 planets-Sun, Moon, Mars, Mercury, Jupiter, Venus, Saturn, Rahu, Ketu, across a number of houses . 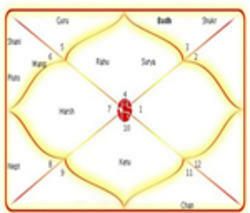 Kundli is Graphical representation of Planets at time of your Birth in a specific method developed by ancient yogis. 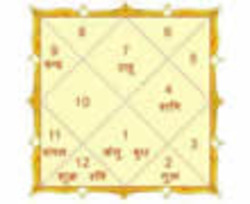 Horoscope indicates the true picture of individuals planets position at the time of rising lagan and the position of different planest at the birth time in the different rashi and steller/nakashtra. The ancient practice of Kundli matching ensures that you find about the compatibility between you and your partner, and work on your relationship and a happy life, likewise. Matching Kundlis in advance ensures that the couple enjoys a harmonious life ahead, and may also take precautionary measures, if needed. One of the many wonderful tools Vedic astrology has given us is "Horoscope Matching". Ancient seers devised an astrological method to help people choose the right partner. Your astrological Vedic Birth Chart (JanamKundli) provides this and much more. Your birth horoscope provides a detailed picture of your karmic journey. : Basic analysis of your and your wife's horoscope. : Astrological details of both of you. : Report about the houses concerned with Child Birth. : Analysis of the concerned Divisional Chart. : Report on the concerned Planets with their effects.